The area to be recorded is the central piece outlined in black. This is recorded as RATS Detached 2. This was the inaugural meeting of the Rothley Ancient Temple Survey which we decided to call RATS. Having completed the paperwork on Rothley Ancient Parish Survey (RAPS) but still needing to bring it together as a publication we decided that this was a good time of the year to start RATS. The vegetation is dying down so autumn is the time to get going. Terry produced the maps showing the Rothley Temple Extra Parochial Detached Parish Boundaries and we decided to start on area 'Detached 2'. 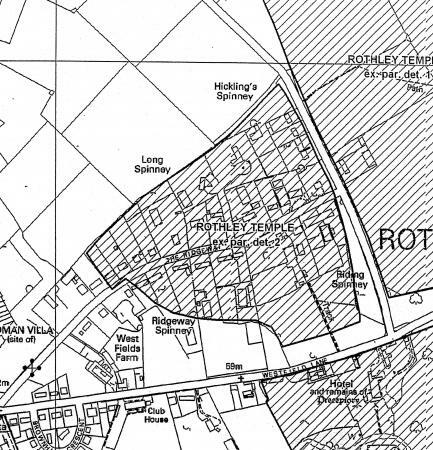 This boundary also forms part of the Rothley Ancient Parish Survey (RAPS) Stints W14-W18 which run through Hickling's Spinney and on the boundary of Long Spinney. Work would continue as in the format for RAPS with no changes. The due starting date is Wednesday 19th November 2008. 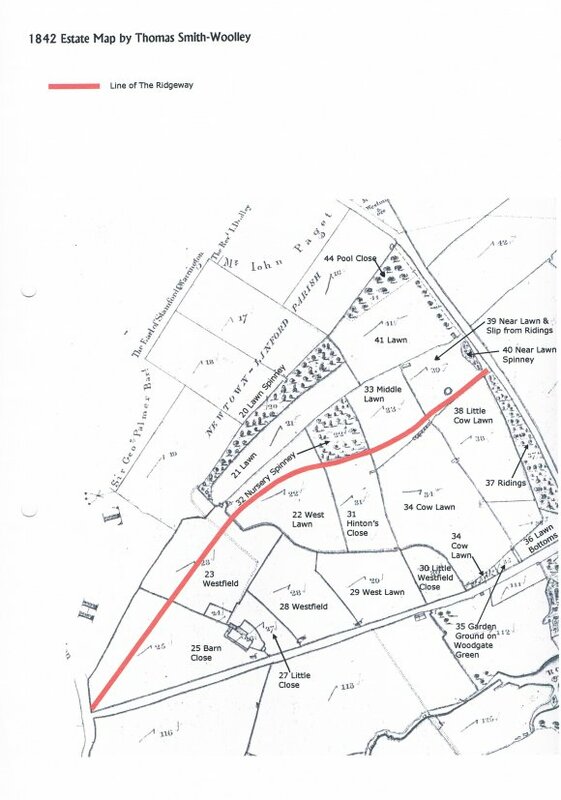 Location: Riding Spinney, Hickling's Spinney and part of The Ridings between these sites. Map Title: Site 117 Riding Spinney, Site 270 Hickling's Spinney and Site 158 The Ridings from Westfield Lane to Swithland Lane. Riding Spinney: 47 The Ridgeway, Rothley. Hickling's Spinney: Details not known. The Ridings: Private houses where we are working. This morning was spent doing a 'recky' of the three areas above, in particular, Riding Spinney where we found an excellent ditch running through just where we wanted it to be. This will be an extremely interesting part of the survey. We checked out Hickling's Spinney where access is easy though the perimeter hedgerow and found evidence of the boundary ditch inside the spinney. Work on recording will begin next week.